The Journal of Geoethical Nanotechnology | Democratic Transhumanism, James Hughes, Ph.D. This article was adapted from a lecture given by James Hughes at the 1st Annual Workshop on Geoethical Nanotechnology on July 20, 2005 at the Terasem Retreat in Lincoln, VT.
James J. Hughes, Ph.D. is Associate Director of the Institutional Research and Planning Department and a Visiting Lecturer of Public Policy for Trinity College of Hartford, CT. Hughes explains that the politics of the 21st century have transcended the two-dimensional paradigm because of the entrance of biopolitics. Biopolitics raises many questions about personhood and human rights and has created unlikely alliances between what would typically be opposing political groups. Hughes urges us to promote a democratic transhumanist view, one that embraces new technologies and does not limit human rights only to humans. The result will be a better world for many diverse groups of people and posthumans. How do we build a transhuman culture and polity in which humans of the 1.0 version (posthumans, A.I.’s and so on) can coexist peacefully and not end up in a civil war? How can we create a forward-looking set of public policies that have more complex answers to the challenges that we face than an attitude of relinquishment? Such policies would take for granted that people will eventually want to adopt and make universally available these technologies because of all of the wonderful benefits that they provide. They would anticipate downsides and accommodate them with possible solutions. What kind of politics need we be grappling with, at least up until 2043, when, due to the arrival of the Singularity, politics becomes irrelevant and we all start shooting out to the stars? What kinds of political engagement need we, as activists, begin thinking about in order to create this kind of a world? Just like the abolitionists or the advocates of the separation of church and state two hundred years ago, we are on the forward edge of advocating a particular kind of social order and determining what that social order might be. I call the politics around that social order "biopolitics". The recent struggle over Terry Schiavo  showed some of the emerging dimensions of that politics. In this situation, there was an enormously unpopular intervention in a very private family decision around whether Terry Schiavo was a person or not. The Democrats seemed completely divided. Tom Harkin, Ralph Nader and Jesse Jackson were all on the side of saving Terry Schiavo against the wishes of her husband, Michael. What was going on? Why were the disability rights activists, who usually side with the Democrats, siding with the “Save Schiavo” campaign? Just as the progressives and the seculars were divided, so were the Christian right and the libertarians. Why? I argue that it was because of this emerging "biopolitics." Pope Benedict , formally known as Cardinal Ratzinger, will be a new player in emerging biopolitics as he has recently announced that bioethics and related topics will be at the top of his agenda. In the politics of the twentieth century, there were two dimensions - a cultural dimension and an economic dimension. Politically, different parties were aligned within this two-dimensional space. In Europe, you could find parties in each of the different corners and in between, and so people kind of figured out where they fell based on their religious views, their attitudes about regulation and egalitarianism, and so on. Biopolitics enters this two-dimensional space, making it more complex. 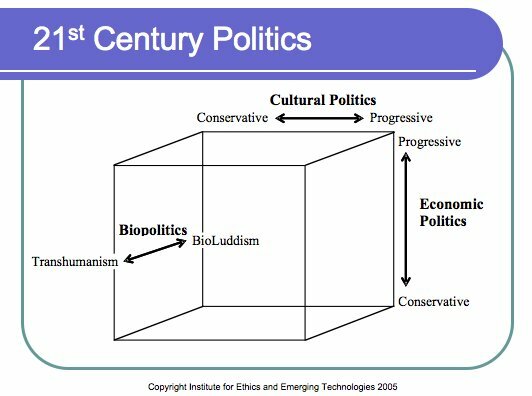 There are people who have one or another of those four kinds of politics who become transhumanists on one end of that biopolitics, and at the other end become what we call now "bioconservatives" or "bioluddites." We do not yet have people in all eight of those corners, nor do we have movements or organizations that represent them all, but I am going to talk about a couple of the movements that show that this space is coming into existence and how we need to respond to it.